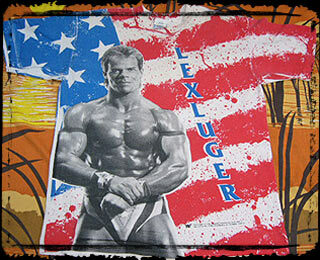 Someone Bought This Classic: One Ugly Lex Luger Shirt - WrestleCrap - The Very Worst of Pro Wrestling! Blade Braxton : While I would never knock a fellow Crapper, I gotta say if the “fashion police” really existed in real life, I’m sure anybody caught wearing this Lex Express-era t-shirt in public would imediately be thrown in front of a moving bus! Someone Bought This: Lex Luger's patriotic pillow! 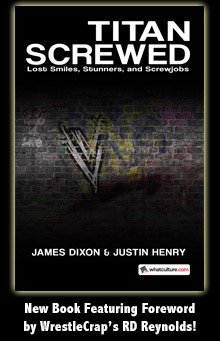 18 Responses to "Someone Bought This Classic: One Ugly Lex Luger Shirt"
I heard Lex only used steroids that were Made In The USA(™). I actually owned that one too! Funnier still, I’m CANADIAN!!! Ya, they were sold out of Bret Hart, Undertaker, and Razor Ramon shirts…so my old man treated me to this beauty! What a joy for a 10 year old who didn’t even like Luger!!! Haha!!! At least my Dad tried! TNA’s RVD shirt from a few years ago is a good example of worse. I would have totally (have my parents) by that in 1994. I would totally buy this in 2014. Would they be thrown in front of the Lex Express? I had that exact American flag T-shirt back in 1991, but instead of Lex Luger, it had “WASHINGTON DC” written across it in neon green graffiti letters (I’d picked it up as a souvenir on our senior class trip). Ah, the early nineties…this shirt reeks of the era! Now that’s a male chastitiy belt if there has ever been one. I don’t know how comfy I am with The Total Packages’ package thrusting out at everyone on a shirt I’m wearing. Do you think he wore the same protective sleeve over his junk to protect people like the one for the bionic forearm? It came out in 1993…..it’s hideous now but in 1993……..
Holding my hand every step of the way. Through these eyes, you could do no wrong. In these eyes, you were brave and strong. In my heart, those days live on. Lex is so shiny you could point a flashlight at his chest and blind someone!